A forum is a place where people have the ability to start communications and reply to other people’s discussion. 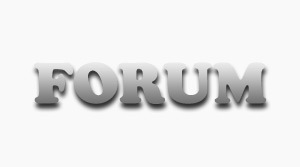 Forum is an online discussion group or discussion area on a website. To become a member of the community in the forum you should registration first and input the user name and password then forum members can post discussions, read and respond to posts by other forum members which is visible to everyone in that community. Thus, a discussion can build up without all users having to be online at the same time. An Internet forum is an online community or a virtual community. An Internet forum is also known as message board, discussion group, online services, bulletin board services, threaded discussions, conferences or web forum. This service provide a variety of forums, in which participants with common interests can exchange open messages. An Internet forum usually allows all members to make posts and start new topics. When two or more member logged in then they can discuss or post forum at the same time.